Like I've mentioned before, I was away for a short vacation from 1st June until 9th June. I traveled to Singapore, Hongkong, Macau, and Taiwan. It was a nice holiday (and tired one too lol). Now, I will share my short holiday with you. I only stayed for 1 day in Singapore. Yes, it is very very very short! just transited here before I went to Hongkong. 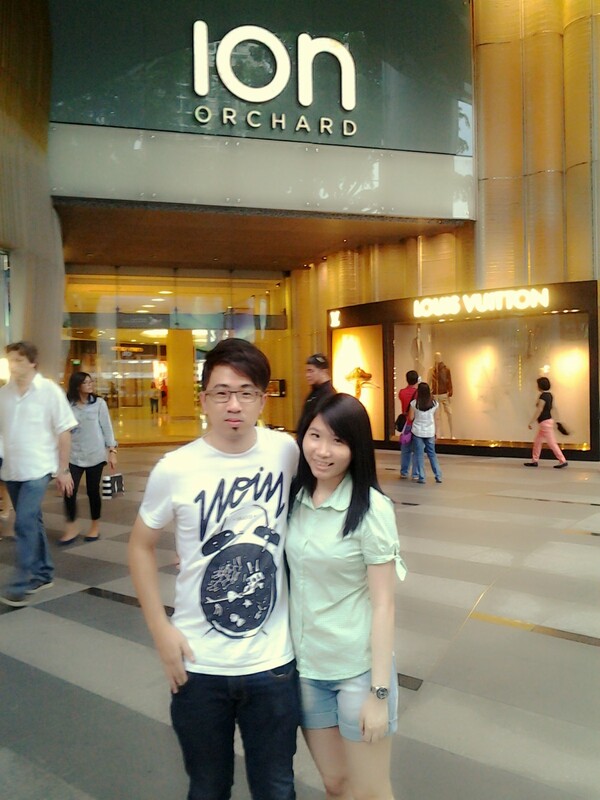 I stayed at Orchard road (the famous road for shoppers), because I only stayed for 1 day and we (me,BF, and his family) want to maximize our time in Singapore. I didn't bought a lot here because the short time. But I managed to grab some items from Daiso and Watsons. I want to shop at Sephora too, but I don't found anything there :( Sephora was very crowded when I visited because it was weekend. So, I just look around and didn't bought anything. I went to Hongkong on the second day. It was a morning flight so I'm kinda dizzy and jetlag. I need to take sleep medicine because I'm afraid I would ended throw up if I stayed awake during the flight. First day in Hongkong, I shopped at Sasa! yes, the famous departement store for beauty products. Before I went to Hongkong, I've already searched some directions to go to nearest Sasa counter from my hotel, but trust me, you doesn't need to do that. Sasa's counters are everywhereeeee... it's like Indomaret / alfamart in Indonesia. Every 5 minutes you walk, you will find the store. From Hongkong, we rode a turbojet to go to Macau. Spend the whole day to visited the famous hotels / casinos like Venetian, Wynn, and Lisboa. Venetian is the most popular casino in Macau (I guess), it is very big! and the mall is very beautiful with a fake rooftop and river. I stayed at Lisboa hotel and I quickly fell in love with the interior. Also the bathroom is very very very beautiful! Okay, Macau is famous for it's casinos, right? I visited the casinos too. I went to Venetian (1 time), Lisboa (1 time) and Wynn (2 times). The total are 4 times. and during all that 4 times, the security always asked for my passport because they didn't believe that I already passed 21 years old. lol. They think I'm still underage to go to casino. The minimum age to enter the casino is 21 years old, if they asked for my passport that means they think I'm still 20 or below that hahahahaha. *See the magic of skincare? * lol For those who don't know, I will be 25 years old by the end of this year. So, yeah I've already passed the golden number 21,almost 4 years ago. Yes, I'm back to Hongkong again from Macau. Spent all two days to visited famous places in Hongkong such as Avenue of Stars, Jumbo Flying Restaurant, Victoria Peak and Madame Tussauds Museum. I visited the tallest building in Taiwan called Taipei 101. It has a very big wind damper that prevent the building to collapse from earthquake. Speaking of earthquake, I personally experience my very first earthquake (I hope I don't have the second one) in Taiwan. It was in the middle of the night, around 00.38 am. Suddenly the windows are shimmy and somehow I feel like going to fall. Luckily it stopped quickly and no bad effect from the earthquake. I also visited famous places like Maokong Gondola, Shillin Night Market, Xi Men Ding, etc. Xi Men Ding~ best place to shop clothes! Speaking of Shillin, in Surabaya there is a snack shop that called Shilin Taiwan Street Snack. it is very famous for their large fried chicken with black pepper / chilli powder. Anddd when I visited Shilin market, it is indeed the famous snack there. You need to queue like 5-10 minutes to get the large fried chicken. Okay, that's all my short recap about my trip. 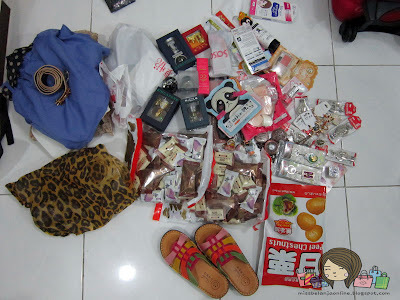 I bought a lot of items but still not satisfied because I think I only do a little shopping. I want to buy more! I even still have my money when I'm back to Indonesia. hikz. Anyway, these are the picture of my haul. Sorry for messy picture, I took this, right after I got home. I will be sell some of the items on my online shop, so if you interested to buy you can visit my shop. Wow! You're very lucky to travel to Singapore and Hong Kong (I've always wanted to visit both of them! I had a cousin who worked in Singapore before) I went to Taiwan back in 2004. I wanna visit again someday. Woah those FACE MASKS are crazy! I wish I can try 1 of each in the future!